1. Half-fill a large saucepan with water and bring to the boil. Place the cabbage wedges into a steamer or colander and put this on top of the pan. Steam with a lid on for about 4 minutes until tender but still retaining a crunch. You may need to do this in batches. Transfer to a large serving bowl. 2. 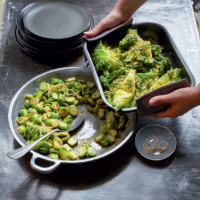 Place the broccoli in the steamer or colander and steam with the lid on for about 3 minutes then transfer to the serving bowl with the cabbage. 3. Heat the oil in a frying pan and add the butter and shallots. Cook gently for a few minutes until the shallots start to soften. Stir in the garlic and breadcrumbs and continue to cook until the breadcrumbs are golden and crispy. 4. Remove from the heat and stir in the parsley and lemon zest. Sprinkle the breadcrumb mixture over the cabbage and broccoli and serve immediately.